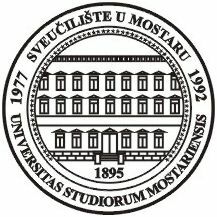 University of Mostar is a higher education institution which organizes and performs university studies, scientific and professional work. It is one of eight public Universities in B&H and the only one where Croatian is used as the official language. The University is founded by cantons in which the Croatian people are dominant. It consists of 10 faculties and the Academy of Fine Arts. Today, over 16000 students study at the University of Mostar. The educational process is conducted through more than 60 study groups at the undergraduate and 30 groups at the graduate and postgraduate level. University of Mostar is internationally oriented and its intention is to become fully integrated into the European Higher Education Area. From the academic year 2005/2006, teaching process at the University of Mostar is conducted in accordance to Bologna process. IRO is responsible for interuniversity cooperation programmes and agreements, cooperation and contacts with relevant international organizations, exchange programs and the management of international relations. At the University there are 11 separate libraries and one main library without joint Library Network Support Services at the university level.